Pop Quiz: What do you make when it’s 95 degrees outside, the very thought of turning on the oven makes you melt into a syrupy mess and yet you’re craving a delicious, starchy, baked-good kind of dessert? If you answered “fruitcake” then I think you need to get your head examined, but the real answer, summer pudding, is somewhat like cake, and it does contain fruit. 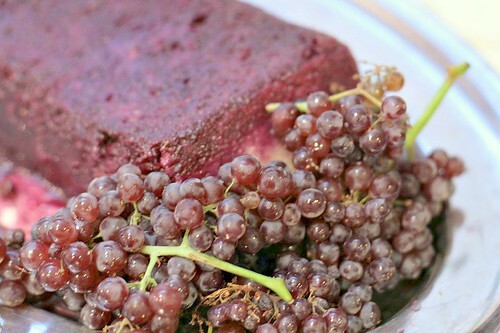 Summer pudding does differ from fruitcake in several important respects, however, the most important of which is that summer pudding does not require ninety minutes in an oven. It requires ten minutes on a stovetop (which is not going to heat up your kitchen) and a few hours in the refrigerator. If you’re wondering what it actually IS, summer pudding is one of those obscurely named British desserts that’s really a bread pudding made with fruits and juices instead of custard. You combine a mixture of summer berries (fresh in the summertime, though frozen will also work beautifully), add a little sugar and heat them for a few minutes, just to release the juices. Said juices then proceed to soak their way into surrounding bread, rendering it muskily flavored, deeply purple, gooey and completely unrecognizable as bread and fruit. 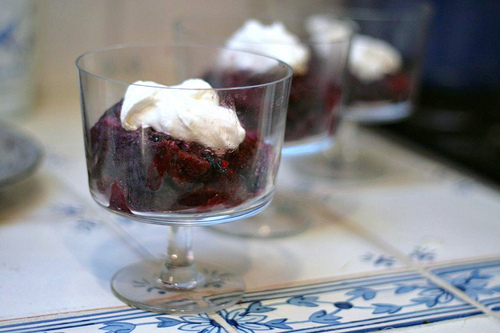 It’s cool and refreshing, but unlike a pesky sorbet or popsicle, summer pudding has enough substance to be satisfying. Combine berries and sugar in a saucepan. Cook over medium low heat, stirring occasionally, until the berries have released their juices and the sugar is dissolved. Cut the crusts off several slices bread. Cut bread into shapes that will line a loaf pan completely, with no gaps. Put approximately half of berry mixture in bread lined pan. 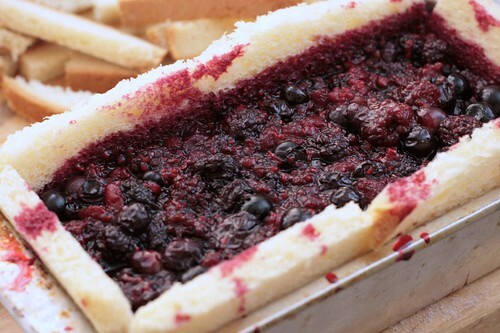 Cut additional slices of bread to form a lid on the berries. 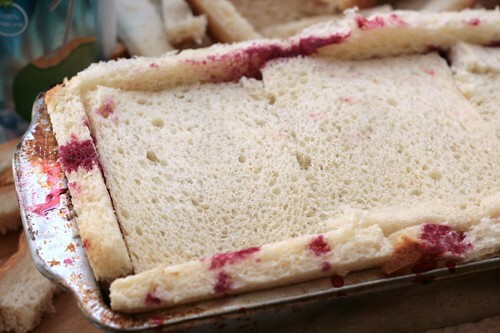 Add remainder of berries on top of the bread, and create another "lid". Cover with plastic wrap, weight down if possible, and store in refrigerator for a few hours until the bread is entirely suffused with berry juices. Turn out on a platter to serve, and scoop into bowls with whipped cream. This looks wonderful. When I’m in the country over the weekend, my local store does not have Pepperidge Farm Bread. They might have Martin’s Potato Bread (which I have never had). Would that work? Looks so delicious! What a great idea to use the bread instead of working on a butter crust. Yum!